↑ "Li Ka-shing". Nndb.com. สืบค้นเมื่อ 2011-05-11. ↑ "pronouncekiwi - How To Pronounce 李嘉誠". pronouncekiwi. Chinese (Hong Kong) Pronunciation. Archived from the original on 2016-03-24. สืบค้นเมื่อ 2016-04-23. ↑ "How to pronounce 李嘉誠". Forvo. 李嘉誠 pronunciation in Cantonese. สืบค้นเมื่อ 2016-04-23. ↑ "李". Teochew Mogher. Archived from the original on 2016-04-25. สืบค้นเมื่อ 2016-04-26. ↑ "嘉". Teochew Mogher. Archived from the original on 2016-04-25. สืบค้นเมื่อ 2016-04-26. ↑ "誠". Teochew Mogher. Archived from the original on 2016-04-25. สืบค้นเมื่อ 2016-04-26. ↑ "pronouncekiwi - How To Pronounce 李嘉誠". pronouncekiwi. Chinese (China) Pronunciation. Archived from the original on 2016-03-24. สืบค้นเมื่อ 2016-04-23. ↑ "How to pronounce 李嘉誠". Forvo. 李嘉誠 pronunciation in Mandarin Chinese. สืบค้นเมื่อ 2016-04-23. ↑ "Silobreaker: Biography for Li Ka-Shing". Silobreaker. 2006-09-26. สืบค้นเมื่อ 2008-06-12. ↑ "Li Ka-shing". Encyclopædia Britannica. Chicago, Illinois: Encyclopædia Britannica, Inc. สืบค้นเมื่อ 2008-06-12. ↑ "Li Ka-shing Net Worth". Cerebrity Net Worth. Archived from the original on 2015-09-28. สืบค้นเมื่อ 2015-09-28. ↑ "The World's Billionaires No. 11 Li Ka-shing". Forbes. 2008-03-05. สืบค้นเมื่อ 2008-12-01. ↑ Schuman, Michael (2010-02-24). "The Miracle of Asia's Richest Man". Forbes. สืบค้นเมื่อ 2012-02-28. 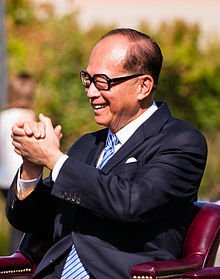 ↑ "Li Ka Shing Foundation :: Li Ka-shing Receives First Malcolm S. Forbes Lifetime Achievement Award". PR Newswire. 2006-09-05. ↑ "CK Hutchison Holdings Limited - About Us > Milestones". ckh.com.hk. ↑ "李嘉誠替唐英年解畫5分鐘 – 新浪網 – 新聞". Sina Corp. สืบค้นเมื่อ 2011-08-05. ↑ "Profile - Ka-shing Li". Forbes. 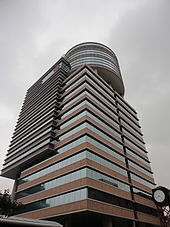 ↑ "PolyU names new tower after Li Ka-shing". Hutchison Whampoa Limited (HWL). 2001-09-19. สืบค้นเมื่อ 2012-10-10. ↑ "State-of-the-Art Cancer Research Centre Opens in Cambridge Supported by a £5.3 million donation from Hutchison Whampoa". Lksf.org. Archived from the original on 2011-10-11. สืบค้นเมื่อ 2012-02-28. ↑ Li Ka-shing endows new oncology professorship at Cambridge Archived มิถุนายน 16, 2012 ที่ เวย์แบ็กแมชชีน. ↑ "About CKGSB". Archived from the original on 2012-02-09. ↑ Donation to go towards Endowment in Support of the Library and SMU Scholarships Archived มีนาคม 9, 2007 ที่ เวย์แบ็กแมชชีน. ↑ Sanders, Robert (2005-06-23). "$40 million gift from Li Ka Shing Foundation boosts health science research". UC Berkeley Media Relations. สืบค้นเมื่อ 2009-05-12. ↑ "Stanford medical school building to promote high-tech learning - with comfort". Inside Stanford Medicine. 2010-05-10. สืบค้นเมื่อ 2013-12-08. ↑ "LKY School of Public Policy receives $100 million from business leader". National University of Singapore. 2007-03-12. ↑ "The St. Michael's Story - Milestone". St. Michael's Hospital. 2005. Archived from the original on 2015-03-04. สืบค้นเมื่อ 2016-04-30. ↑ "Li Ka-shing donates C$28 million to the University of Alberta". 2010-04-23. Archived from the original on 2013-05-07. ↑ "Hong Kong makes voluntary donations for Sichuan earthquake". Xinhua News Agency. 2008-05-14. Archived from the original on 2012-11-07. สืบค้นเมื่อ 2012-02-28. ↑ "Building bridges across the Pacific". McGill University. 2013-09-12. Archived from the original on 2013-09-17. ↑ "Li Ka Shing Gift Supports UCSF Quest for Precision Medicine". UCSF. 2013-03-22. Archived from the original on 2016-01-05. สืบค้นเมื่อ 2013-12-08. หน้านี้แก้ไขล่าสุดเมื่อวันที่ 26 ตุลาคม 2560 เวลา 16:55 น.